Home → Top 10 Sights to visit in Val d’Orcia: The Paradise of Tuscany! Top 10 Sights to visit in Val d’Orcia: The Paradise of Tuscany! The southern part of Tuscany, known by the beautiful name of Val d’Orcia, is Tuscany at its best. I have to admit that is the part of Tuscany I’ve fallen in love with and that honestly I prefer. This is also one of the areas in Italy where to find some of the most beautiful scenic landscapes; the most emblematic images with cypress trees, hills, fortresses, vineyards… mostly come from the amazing countryside of the Val d’Orcia Park, south of Florence and Siena. The province of Siena is characterized by an incredibly beautiful landscape, here are some of the most scenographic hill towns and villages of all Italy. Actually Siena can be a perfect base in Tuscany! You can’t come to Tuscany without visiting this paradise! 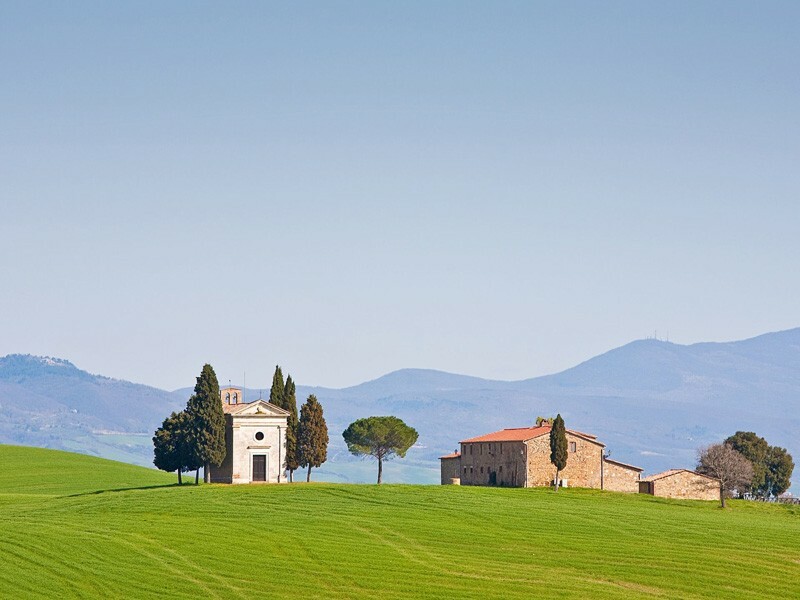 A journey to Valdorcia will lead you through some of the most enticing scenery imaginable. 1- Pienza: spectacular and perfect Renaissance hill town boasting a unique panorama all over the Orcia Valley. Don’t miss the Pecorino cheese rolling tournament taking place at the beginning of September. 2- Montalcino: the perfect medieval hill-top town, popular as the home of the Brunello di Montalcino, extraordinary red wine. Walk around its battlements to have a breathtaking view. 3- Sant’Antimo Abbey: one of the most beautiful and fascinating Romanesque abbeys in Italy, founded by Charlemagne, according to legend. Not to be missed. 4- Bagno Vignoni: charming and atmospheric tiny Renaissance village with fantastic hot spring waters and a huge thermal pool as its central square! 5- Rocca d’Orcia or Rocca a Tentennano: imposing medieval tower spectacularly rising on a rocky outcrop and dominating all the Valdorcia with a breathtaking unforgettable panorama. 6- Castiglione d’Orcia: lovely village just below the rocca, with three wonderful medieval churches with panels by Pietro Lorenzetti. 7- San Quirico d’Orcia: typically medieval walled village with the beautiful Romanesque church La Collegiata and the 16th century Horti Leonini gardens. 8- Radicofani: the Fortress and Castle of Radicofani, 783 mt above the sea level, boasts stunning views. Its name is connected to Ghino di Tacco, a bandit of the 14th century mentioned by both Dante and Boccaccio in their writings. 9- Monastery of Sant’Anna in Camprena: stupendous monastery surrounded by a landscape of unusual beauty; chosen as a location for filming the famous movie “The English Patient”. 10- Bagni di San Filippo: renowned for its curative sulphur hot springs cascading from scenic calcareous white rocks. Enjoy its thermal waters in the modern spa. Need Help in Planning your next trip to Italy and Tuscany? Ask Here! it’s Free! I have visited Tuscany many times (by car) and my favourite place so far has been the little village of Lucignano (southeast) but there are so many beautiful places to choose from! Elena, I am traveling to Tuscan region from Nov 14- 22 and wanted to know if you have specific on Bagni di San Filippo being open that timeframe and a direct route to get there? Thank you so much for your help! Bagni di San Filippo is a lovely place, I think you refer to its thermal baths, that are now unfortunately closed until 2016. Near Bagni di San Filippo is another fantastic thermal hill town, the beautiful Bagno Vignoni, where you can choose among 2 hotels.